"When I saw two local doctors having treatment at your office, I knew this was the right place!" "After unsuccessful results at other facilities my doctor recommended you. I found your staff to be more caring, and they took the time to listen to me. With better techniques, and a personal approach, they were able to get me the help I needed." The Physical Therapy Center in Osterville, opened in 1985 as a private rehabilitation facility specializing in hands-on manual therapy. The location is particularly convenient for residents of Barnstable, Mashpee, and Sandwich. 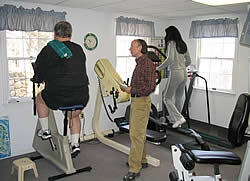 The Physical Therapy Center in Buzzards Bay, opened in 1995. Near the Bourne Bridge, it is convenient for residents of Bourne, Plymouth, Wareham, and North Falmouth, as well as for commuters to and from the Cape. Both clinics are modern state-of-the-art facilities with fully equipped gym and exercise rooms. Private rooms are utilized for individual care. After an initial evaluation by the physical therapist, a customized treatment plan is developed for each patient in consultation with the referring physician. Treatments are strictly one-on-one, and the patient's progress is continually monitored. Cape native Jeanne Christopulos Egan, DPT, PT, OCS, is the founder of the Physical Therapy Center. With over 30 years of experience, Jeanne receives referrals from doctors located across the Eastern Massachusetts region, from Boston to the Cape and the Islands, because of her expertise in quality orthopedic and osteopathic rehabilitation.